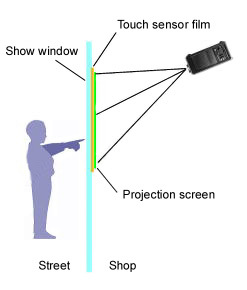 TouchVu is an interactive membrane that enables your target audience to access information from your shop front window. Use the 'WOW' effect to grab the attention of your customers, promoting your business and providing up to date information, during and after business hours. Using your finger as the 'mouse pointer', the "Touch Function" allows customers to seamlessly interact with your displayed content, whether it be your web site, directory information or accessing catalogue and pricing information. All this is at the tip of your fingers. "Touch and Drag- Function" is also available for slide show applications or to move objects around the page. TouchVu interactive foil can be utilised for use with LCD screens or On-Glass Rear Projection film. (up to 100" 16:9). The adhesive film is applied to a piece of transparent glass, acrylic panel or straight onto your shop front window. With the TouchVu Foil and display device behind the glass or acrylic, the user is at no time in direct contact with the sensor, therefore eliminating possibilty of damage through misuse. TouchVu can also be built into stand alone kiosk unit applications for use in-store. TouchVu is not affected by light and can be used in any lighting environment. Retail Stores, Corporate Entries, Internal Communication, Production Lines, Exhibitions. Special Effects, Kiosks. Suitable for On-glass Projection or LCD displays. 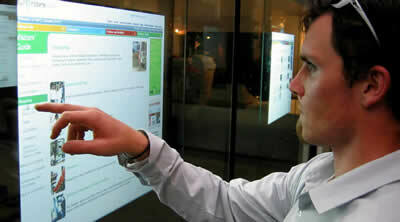 Format Interactive Touch Screen Technology for Through Window applications, i.e. fitted to an existing window. Fixing Options Removable and permanent options available. Position Accuracy Approximately 3mm absolute, 1mm relative. No drift. Alignment Software divers provide a calibration facility. Speed of Response Depends upon glass thickness. Typically 50 to 10ms. Output USB or RS232C communications to a 9 pin D female. Software Compatibility Drivers are available for Windows Operating Systems. Temperature Range Better than -10 to 70 ºC. Humidity Controller 0% to 95%. Unaffected by condensation. Light Transmission Depends upon glass thickness, usually better than 85%.